The first and only pregnancy test that tells you how many weeks since you conceived - 1-2, 2-3 or more than 3 weeks. Over 99% accurate at detecting pregnancy from the day you expect your period. Displays clear digital results in words 'Pregnant? or 'Not Pregnant?. In a UK study, over 9 in 10 women thought digital results were more accurate than strip tests ( 111 women using and reading different test types). No. 1 brand most recommended in a survey of doctors in the UK. Data on file. Easy to use, easy to read. 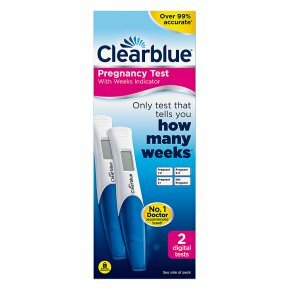 The Clearblue Pregnancy Test with Weeks Indicator is the first and only test that is as accurate as an ultrasound scan at dating pregnancy*. Its smart dual sensor not only tells you in words on the digital display if you're pregnant or not pregnant, it also tells you how far along you are ? the weeks since conception are shown as 1-2, 2-3 or 3+. You can test 5 days before your missed period (which is 4 days before your expected period). In lab testing, 98% of pregnant results were detected the day before the expected period, 97% 2 days before the expected period, 90% 3 days before and 65% 4 days before the expected period. (*Weeks result 97% in agreement with later ultrasound dating scan. Based on studies of 187 women comparing result to ultrasound dating). For more information on this product or answers to your questions, our Careline advisors are available for you 07:00 ? 15:00 hrs Mon-Fri, excluding Bank Holidays. Please read enclosed instructions carefully before use.